I had so much fun with Paper Sundaes Challenge #3! 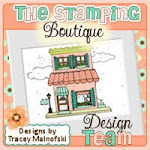 This week's challenge was sponsored by Paperworks Co and we got to use stamps from the Freckle Love Connection and you can see and purchase them all here. They are adorable and I want them all! We needed to make a Valentine themed card. I got to use the image "First Date" which I absolutely fell in love with! It was sooooo much fun to colour. 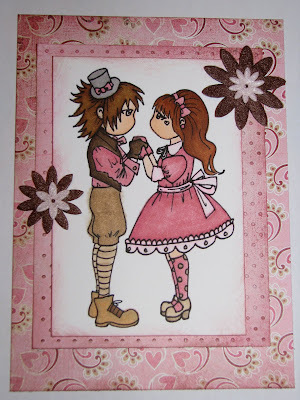 For my card I used Bo Bunny "Sweetie Pie Smooch" paper and Bazill Cardstock. I coloured with copics (R02, R29, R39, W4, W6, E00, E02, E13, E15, E35, E37, E41, B21, B23, YG11, YG13, YG23, YG63, RV32, RV34). I also used some chipboard hearts and used my Glue Pad and applied some Pink Glitter Ritz to. I inked the edges of the image and used some green ribbon that I picked up this past weekend went I went down to our family cabin on Lummi Island, WA. 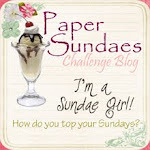 Be sure to visit Paper Sundaes Challenge Blog and play along, it's so much fun! The winner this week will win a $25.00 gift certificate for Paperworks Co :) Not only do they have stamps but paper, adhesives, embellishments and lots more! This card was entered also entered in the following challenge: A Spoonful of Sugar (freestyle). I used Tilda sitting with Hair Bow and coloured her with my copics (E00, E02, E31, E35, E41, E43, E44, E55, E57, B00, B02, R02) and then used my Inkssential white pen to highlight her cheeks. I used some nestabilities that I got from my stamping pal Carla and inked the background with brown ink and drew stitching with my copic multiliner. The design paper I used was some leftover scraps I had from a card I made earlier and is from Kaisercraft's Line "Reminiscing". The flowers I got from a company called Wild Orchid Crafts! They make such cute flowers and the pricing is so good. My other stamping pal Jenny sent me some in a secret sister swap earlier this year. The sentiment is one I've had for quite a while. Paper Sundaes Challenge #1 - How do you top your Sundaes? I'm so excited, I've been waiting for this day to arrive for weeks! 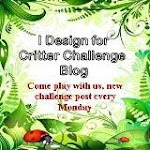 Today is the first ever PAPER SUNDAES blog Challenge #1 (PSC1)! 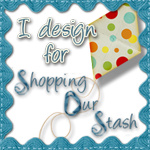 When I was recently asked by Shana and Christine to join the Design Team for Paper Sundaes Challenge Blog I delightfully accepted! This great blog posts new challenges every Sunday so be sure to check back often and play along! 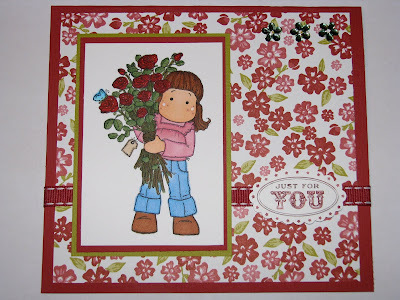 The first challenge was a sketch challenge and is sponsored by Lacey over at Stamp & Create! Before we had a sponsor for our first challenge I had already made this card below using Magnolia's Tilda with a Bunch of Roses which I coloured with my copics and spica glitter pens. The paper and ribbon I used was all from Stampin Up and the sentiment "Just for You" is from the set "Oval All" by Stampin Up which I received over at the Cdn Express Thread at Splitcoaststampers! The rhinestone flowers were part of my stash that I picked up at our local dollar store (I think). 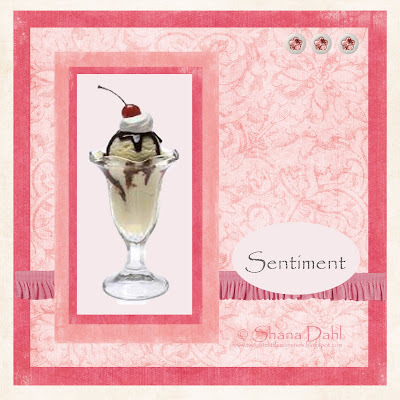 Hope you enjoy my card and have fun with Paper Sundaes new Challenge Blog. I'm already looking forward to next week's challenge :) Be sure to check out the links (right hand side of my blog or on the Paper Sundaes Blog) to the other members of the Paper Sundaes Design Team, their work is AMAZING! I will be trying to reach you via email so I can get your prize out to you! A big thank you to you & everyone else who played along and made our blog hop such a success! We hope you come back and join us each week for a new challenge :) Happy Sundae! I love Ildi Co's line of Cuddles Kuma digital stamps! 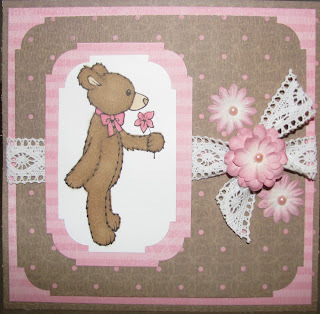 The image I used for this card is called "Cuddles Kuma Forest Thinks"....isn't he a cutie? I coloured with copics (E21, E31, E33, E35, E37, E39, B41 & B45) and the designer paper was from KaiserCraft Reminiscing line. I used Bazill Cardstock for the base of the card and the brads were from my collection. Be sure to check out all the Cuddles Kuma digi stamps at Ildi Co's website. I love these digi stamps because you can size them however you like and they are just too cute! Welcome to Paper Sundaes first ever Blog Hop! I'm glad you joined in and are playing along. If you arrived here from Carla's Blog then you are on the right track! If not, please go back and start at the beginning which is Christine's Blog so you don't miss out on any of the beautiful cards from our amazing Sundae Girls Design Team (and for your chance to win some pretty yummy blog candy). Remember to check out and comment at all stops so you don't miss your chance to win any candy and finish at Paper Sundaes Challenge Blog for the big candy! The next stop on our blog hop is Danielle! Be sure to check out her amazing card and watch out for eye candy along the way. For your chance to win my blog candy you must be a follower of my blog and a follower of Paper Sundaes Challenge Blog and leave me a comment to let me know. 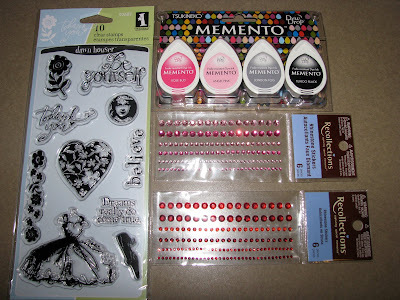 My blog candy includes stamp set called "Friendship" from Inkadinkadoo containing 10 clear stamps, a set of 4 Memento Dew drops (Rose Bud, Angel Pink, London Fog & Tuxedo Black as well as 2 sets of rhinestones (1 pink & 1 red). Be sure to join us on Sunday, January 17th at Paper Sundaes for our first challenge and the announcement of the blog candy winners! 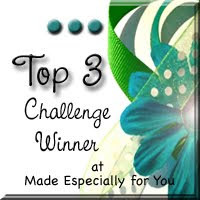 Be sure to check back here to see my challenge card & find out the winner of my blog candy :) How do you top your Sundaes? The brand new challenge blog Paper Sundaes will be announcing their first challenge on Sunday, January 17th and to celebrate in the meantime please join us & meet our amazing design team for our first ever BLOG HOP this Sunday, January 10th! There will be blog candy offered by our design team members as well so be sure to follow along and visit each member of our design team to see their wonderful creations and for your chance to win!